The 2018 Ford Escape is a smart choice for individuals or families looking for a small crossover. The Ford Escape offers a roomy cargo space, 34 cubic feet of standard cargo space or 68 cubic feet with the rear seats folded. Small enough to offer fuel economy but large enough to haul around your gear, this crossover ranks high in its class. The 2018 Ford Escape offers a number of features for your convenience and safety. The hands-free liftgate is foot-activated. Just kick your foot under the center of the bumper and the liftgate opens automatically. No need to fumble for keys or set your packages down! The Intelligent 4WD System is available for your safety. Continuously monitoring the traction and road conditions every 16 ms, it will transfer torque from the front wheels to the rear as appropriate to ensure a great handling and excellent traction. Stay alert with the Lane-Keeping System, which will alert you to unintentional lane drifting. Adaptive Cruise Control not only lets you set the speed you want, but also lets you set the desired distance you prefer to maintain from the vehicle in front of you. Forward Collision Warning with Brake Support can alert you to a potential collision with the vehicle ahead of you, and take action if you fail to react in time, thus keeping you and your passengers safe. Available Enhanced Active Park Assist uses ultrasonic sensors to scan for an appropriate space and steers you into the space while you control acceleration and braking. With 3 engines to choose from, 3,500 lb. towing capacity, and Six-Speed Automatic Transmission with SelectShift, what’s not to like about the new 2018 Ford Escape. Simply take a drive to the Olympia Auto Mall and choose your favorite color! The 2018 Toyota 4Runner is ready to take you on an adventure. The 4Runner has been a Toyota heritage for over 30 years, and keeps getting better. The 4Runner continues its superior off-road abilities by maintaining its body-on-frame construction. The 4Runner Limited comes with beautiful chrome accents on the door handles and front grille that set it apart. The running boards, signal lights on the mirrors, fog lights, and black 20-inch alloy rims with brushed aluminum face give this SUV a personality all its own. The 4Runner TRD Pro takes this legendary toughness to a whole new level. With heavy-duty suspension, the TRD Pro is built to rule the off-road. Proven engineering allows you to canvas the most challenging terrain. The stamped aluminum front skid plate adds strength underneath, while the TRD alloy wheels are wrapped in 31.5-inch Nitto Terra Grappler all-terrain tires designed for maximum traction. These durable Toyota SUVs are built to last. Come on in and test drive one today. We’ll tell you all about the 4WD with Active Traction Control, the Kinetic Dynamic Suspension System (KDSS) and Crawl Control (CRAWL). Take one home, test out the all the features, and get this truck dirty. Let the 2018 Toyota 4Runner show you what off-road really means! The new 2018 Chalet A-Frame Travel Trailers are quality recreational vehicles hand-crafted in the heart of Oregon. 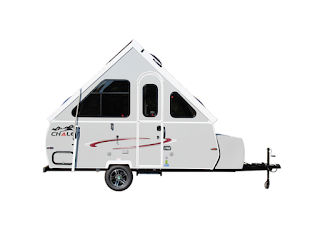 Chalet has been building the highest quality A-Frame trailers for over 30 years. If you have a passion for the outdoors, these unique travel trailers are worth investigating. These great trailers come in 3 sizes - 12’9”, 15’6”, and 18’7”. They are made of a lightweight construction that helps with fuel efficiency. They collapse for easy towing and storage. If you or a member of your family is tall, our A-Frame campers are just what you need. They provide a generous 8’ of headspace allowing you to stand upright inside the cabin. Chalet A-Frames are built with powder coated steel frames which provide a study foundation. The powder coating provides years of rust protection. The sidewalls are vacuum bonded keeping you comfortable and dry, regardless of the weather conditions. Chalet campers and optional dormers are hard sided (no canvas) allowing you access to more remote camping sites. The optional dormers offer 80” of headspace. With no canvas, there are no cloth parts to dry out or replace. Insulated laminate flooring is lightweight and vacuum bonded. Another sturdy aspect of our wonderful A-Frame collection. Intriguing…yes, they are and they are available right here at the Olympia Auto Mall. Stop by with your hitch and haul one home! The new 2018 Mazda CX-3 is technology that is not only striking in design, but inspires confidence on the road. In Japanese, the word “Kodo” is the primal source of rhythm or heartbeat – expressing energy and movement in design. The Mazda CX-3 is striking, both in its athletic silhouette and in the contours which make it uniquely Mazda. Mazda believes that your emotional response should equal your mechanical love for their vehicles. Mazda’s latest technology just gets better. SkyActive-Vehicle Dynamics has G-Vectoring control which not only provides for a smoother ride, but makes the overall experience less fatiguing for you and your passengers. The system is seamless, adjusting power delivery and shifting vehicle weight on the curves. The effects may be subtle but the results are terrific. A great ride just made driving even better. Sophisticated technologies work together to keep you safe. The i-ACTIVSENSE technology uses radars and cameras to keep you on the road and aware of your surroundings. Feel the comfort of knowing your car is looking out for you, ready to alert you to potential hazards or even help your avoid or reduce collisions. Passive safety technology protects occupants and limits damage when an accident is unavoidable. Lifesaving technologies to protect you and your loved ones. Come to the Olympia Auto Mall and experience Mazda first hand. More control. More comfort. More exhilaration!